Or, how the hell can I get a Kindle without ordering it online? PC Richards: Hello, this is PC Richards, can I help you. Me: Yes, can you tell me if you have the Kindle in stock. Hold. Hold. Hold. Hold. Hold. Give up and redail. Hold. Hold. Hold. Hold. Hold. Finally someone picks up. Sales Associate: We dont carry the Kindle. Best Buy: Hello, this is Best Buy northeastern regional office. If you would like the Westbury store please dial (totally muffled numbers reminiscent of the announcement in the subway). Redial 411 get correct number. Best Buy: Hello, this is Best Buy, please hold. From Dec 26th – 31st the Geek Squad will have a hotline to help you with all the cool tech stuff you bought. We have 17,000 geek squad technicians nationwide. Hmmm… I would be happier with the 28,000 number. Maybe we could train the people who are eligible for phone upgrades daily to beef up that stat. Sales Associate: Hello, this is Best Buy, can I help you. Me: Finally! 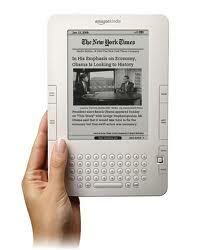 Do you have Kindles in stock. Sales Associate: Sorry, sold out. FYI, total of 12 minutes on hold to find this out. Still better than PC Richard that did not even sell them. Or the 2 Staples that we had visited in the time that we were on the phone on hold. They had signs in every window advertising the Kindle till we got inside only to find out… they were out of stock! Solution: Amazon… pay the $20 for overnight shipping. Call it a day. Moral of the story? Read a book. leave it to you to know everything! unfortunately these were time sensitive gifts and we needed them MONDAY! but thanks for that info. Or buy an e-book instead. Amy, now Mercury is in retrograde… not a good time to shop anyway! Damn mercury in retrograde…gets me every time! Actuually in my book it is never a good time to shop. Believe it or not, it arrived the next day. we are in NY so I assume the warehouse was local. Arrived before 4PM.